I’m quoted in this article in the Freelance Success newsletter (for subscribers only). If you follow my blog, you’ve already learned about Pofeldt’s book in “My 2018 reading, with recommendations for you” (April 4, 2019). The SEC’s 2018 rule proposals dominated answers to a NAPFA member survey asking, “What is your top regulatory/legislative concern over the next year?” However, healthcare was also a big concern. My article appeared in NAPFA Advisor (September 2018). The cornerstone of the revised Code of Ethics and Standards of Conduct is the expanded application of the fiduciary standard, said Rydzewski. My article appeared in the NAPFA Advisor (August 2018). Almost two-thirds of NAPFA members responding to a survey have encountered elder abuse among their clients. They shared their advice on how to respond to potential abuse. My article appeared in NAPFA Advisor (August 2018). Keeping your clients safe from fraud is not enough to make the regulators happy with your firm’s handling of cybersecurity. Documenting your policies and procedures is also essential. My article appeared in the NAPFA Advisor (July 2018). All the advisors who responded to this survey said that they discuss budgeting and debt management with their clients, but in different ways. My article appeared in the NAPFA Advisor (June 2018). More than half of NAPFA members surveyed said that many or most of their clients have disability insurance. The article discusses best practices for disability insurance. My article appeared in the NAPFA Advisor (May 2018). A survey revealed that responsible investing isn’t a universal concern among NAPFA members’ clients. In addition to reporting survey results, the article shares resources for responsible investors. My article appeared in the NAPFA Advisor (April 2018). My blog post, “Work smarter, not harder, on your blog,” was republished on SEI’s Practically Speaking blog (March 13, 2018). I’m featured in the #FEMALESANDFINANCE series on LinkedIn (March 11, 2018). NAPFA members are more likely to listen to podcasts for business than for non-business purposes, according to the results of a member survey. The article discusses how members create and use their podcasts. My article appeared in the NAPFA Advisor (February 2018). KBKWealth Connection recognized me in “Check Out These Breaking Money Silence Revolutionaries” as one of three people working to empower clients to talk more about the human side of finance (Oct. 18, 2017). “Legislation affecting healthcare” took the top spot in NAPFA members’ responses to a survey asking “What is your top regulatory or legislative concern over the next year?” My article appeared in the NAPFA Advisor (Oct. 2017). Freelance Success wrote, “Financial writer and FLXer Susan Weiner posted this quiz estimating longevity on a Juggler Forum discussion of retirement. Take it. It may make you think twice about how you’re planning and saving” (Aug. 4, 2017). Financial Planning magazine quoted me saying, “Show your personality…. If you can convey something that distinguishes you, you can create a strong relationship before they even pick up the phone” (April 12, 2017). Blog Post Length: How Long is Too Long? SEI’s Practically Speaking blog has republished my blog post asking “How long is too long for a blog post”? As SEI’s introduction says, “while blogging is important, you don’t have to write ‘War and Peace’ every time. The post doesn’t have to be long to be good (and helpful) to get your message out there” (April 11, 2017). I’m included in the Xtiva blog’s list of “Finserv People to Follow,” along with people like Sheryl Garrett, Michael Kitces, Carl Richards, and Bill Winterberg. The blog says “Follow Susan for tips to improve your writing where it counts – including your client communications and marketing materials” (April 3, 2017). Advisor Websites interviewed me about financial writing best practices. I discussed how you can achieve the 3 Cs of being compelling, clear, and concise. Plus, I explained my path from Japanese historian to financial writer (March 6, 2017). My blog post on “Words to avoid in your investment communications with regular folks” was republished on the kbkwealthconnection blog (Feb. 22, 2017). I’m delighted that Kathleen Burns Kingsbury is helping to spread the word about the need for plain language. Advisor Websites included my Investment Writing blog as one of the best blogs for financial advisors. Sixteen blogs appear on its list, including The Reformed Broker, Abnormal Returns, and FP Pad (Jan. 19, 2017). Feedspot named my Investment Writing blog as one of the “Top 100 Investment Blogs & Websites for Investors.” Blogs were selected on the basis of their Google reputation and Google search ranking; influence and popularity on Facebook, Twitter and other social media sites; quality and consistency of posts; and Feedspot’s editorial team and expert review. Even though my blog isn’t really about investments, it’s an honor to appear with blogs like the CFA Institute’s Enterprising Investor and blogs from companies like Vanguard and Invesco (Jan. 14, 2017). My book and I are mentioned in this article by blogger Michael Kitces (Dec. 29, 2016). 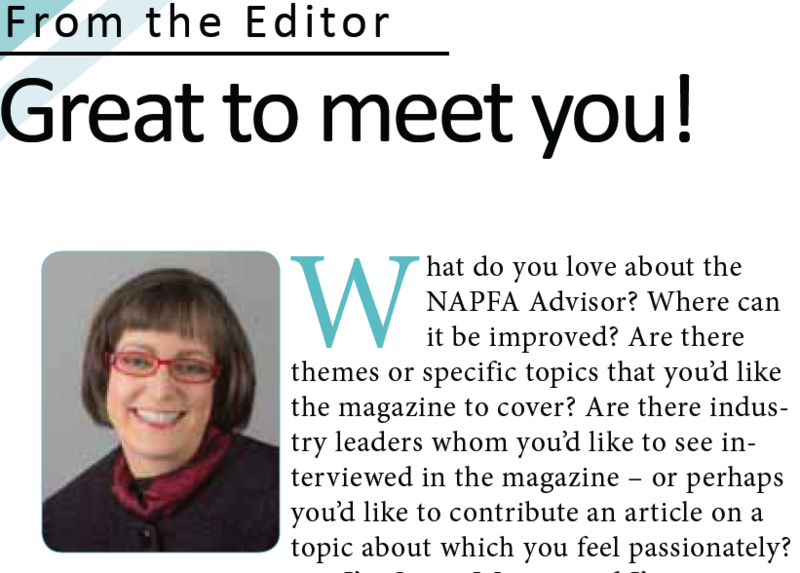 I’m the new editor of the NAPFA Advisor, a monthly magazine. I’m looking forward to working with the NAPFA staff, members, and authors. The November issue will be the first published under my leadership (Nov. 1, 2016). Referring to “Financial jargon killer: The Wall Street Journal,” the John Lothian Newsletter said, “We read a great deal of financial news to compile this newsletter and provide our readers with the best of the best articles. We have to cull far too many inscrutable articles because they are laden with impenetrable jargon. This particular article was written several months ago but we just came across it and felt it is timeless advice that anyone writing financial articles should heed be it a blogger or Bloomberg” (Oct. 14, 2016). “Starting a blog doesn’t guarantee success, especially if you can’t generate a steady flow of posts with topics that entice readers,” as I say in my guest post “6 Keys to Finding the Best Blog Posts to Attract Clients” on ThinkAdvisor (Sept. 22, 2016). 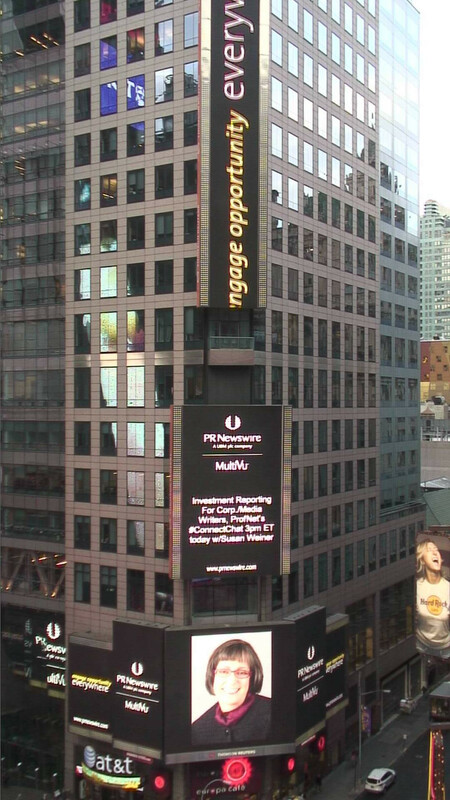 My photo appeared on an electronic billboard in Times Square when I spoke on #ConnectChat. Advisor Perspectives featured my guest post, “8 Reasons You Need a Financial Blogging Process,” on Sept. 19, 2016. If you are struggling with blogging, it may be for one of these reasons. The American Society of Journalists and Authors published my post, “A Goal Buddy Can Boost Your Writing Business” on its blog (Sept. 7, 2016). Do you know the saying, “What’s measured gets done”? Perhaps that’s why my buddy and I started doing quarterly reviews. Even if you’re not a writer, you may find tips you can adapt to your business. I am on a list of the 100 most influential women in finance on social media (August 1, 2016). Kurtosys ranked members by their Klout score. I’m listed in this NexChange article about women worth following on Twitter (June 2016). “This post is a must read and Susan is a must follow on social media for any advisor who is trying to grow their businesses,” says John Anderson in his introduction to my guest post on SEI’s Practically Speaking blog (June 2, 2016). Advisor Perspectives featured my guest post, “Five Writing Mistakes that Sabotage Your Investment Commentary,” on May 19, 2016. Are YOU making any of the mistakes that I discuss? For example, if your investment commentary simply says the stock market did this and the bond market did that, nobody will care. A slightly revised version of “Are financial predictions too risky for investment commentary writers?” appeared in Hedge Fund Insight (May 5, 2016), a U.K. publication. Learn tips from self-published authors, including me, in this interview on The Writer’s Place (May 3, 2016). Two of my articles, “Stop saying ‘Click here’!” and “Write so technical topics are easy to understand,” are excerpted in Nancy Lininger’s CompliancE-news (April 29, 2016). Would you like better results from your investment commentary while suffering less pain as you write? Follow the five-step process I describe on ThinkAdvisor (April 8, 2016). Michael Kitces includes my post on “How to edit your financial firm’s bios” in his weekly round-up for financial advisors. Check out his round-up for more useful links. I’m presenting on a panel to members of the American Society of Journalists and Authors (ASJA) on April 27. If you’re a local ASJA member, you should have received an email notification. My strategy for marketing through monthly and weekly newsletters is featured in the Freelance Success newsletter (April 7, 2016). Learn how to honor your loved ones with scholarships. Read “Paying It Forward With Scholarships” in Vested (Winter 2016). Would you like to increase your financial blogging productivity? Stop doing this one thing and you’ll produce more blog posts with less effort and more fun, as I say in my guest post on the XY Planning Network blog (Feb. 11, 2016). “For all those financial advisors struggling to figure out what to write about on their company blog, Weiner offers up a remarkably simple and straightforward approach,” says Michael Kitces, writing about my blog post, “Blogging the mistakes your clients make” (Dec. 25, 2015). If you make data mistakes in your investment commentary, learn from the mistakes and improve your process so you don’t make the same mistakes again. That’s one piece of advice from my interview on the Synthesis Technology blog (Dec. 17, 2015). Most financial writing is aimed at readers with an educational attainment above the 12th grade—high school graduates and those with some college—which “may be too high for audiences with short attention spans.” To rectify this shortcoming, she suggests using www.hemingwayapp.com, which rates your writing for complexity and highlights sentences that might challenge readers’ erudition or lack of it. Indeed, it urges you to avoid long sentences (such as the previous one.) So, it should come as no surprise that my most recent column on Barrons.com was deemed to be at a 14th grade, or college, level—clearly unacceptable by current standards. “Donald Trump, grade level, and your financial writing” is my post referred to by Forsyth. “The way an advisor phrases an email or a blog post can send important messages to clients or readers,” as I say in “Your Idea of Effective Comms Might Not Be What Works” on Financial Advisor IQ (Nov. 16, 2015). The motivation for researching family genealogy varies greatly among families. Regardless of your motivation, you can learn more about the process in my article, which appeared in Vested (Fall 2015). Many of my tweets from the CFA Institute’s Fixed Income Conference are quoted in “#CFAFI – Fixed-Income Management 2015.” You’ll recognize tweets from my headshot photo and Twitter name (Oct. 24, 2015). My blog is one of the “Seven Essentials for Modern Advisor Marketing.” “It’s packed with blog topic ideas, writing tips, and other helpful content specifically written for financial services professionals who want to make an impact with their marketing content,” says the eMoney Advisor Blog (Oct. 22, 2015). I was interviewed by ProfNet for their #ConnectChat on “Investment Reporting for Corporate and Media Writers.” The interview is featured on ProfNet’s blog (Oct. 14, 2015). 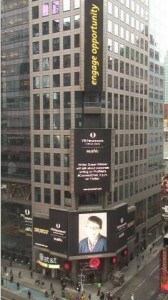 ProfNet put my photo on an electronic billboard in Times Square to highlight my participation. My advice to a fellow writer was featured in “6 Things You’re Saying to Yourself That are Holding You Back” on the Psychology Today blog (Sep. 29, 2015). My blog post, “Tweet your quarterly investment commentary for more impact” is highlighted in “One easy fix to get more market commentary readers” on Sunstar Strategic’s FundFactor blog (Aug. 24, 2015). My blog post, “Are financial predictions too risky for investment commentary writers?” is highlighted in the beginning of “It’s Difficult to Make Predictions, Especially About the Future” on David Merkel’s Aleph Blog (July 18, 2015). Some of my tweets from a round of live-tweeting were highlighted in “Insights from Alternatives Best in Boston” (July 20, 2015). Tom Brakke, whom you may know from The Research Puzzle blog, wrote about tips from my webinar in “Improving Your Investment Commentary” on the CFA Society Minnesota blog (July 14, 2015). “Don’t let compliance issues become an excuse for mediocre content. Heed these tips from author and financial services expert Susan Weiner,” says Ryan Johnson in an article that appeared on the Imagination Publishing blog (July 1, 2015). Is a Vacation Home Alternative Right for You? There are alternatives to traditional vacation home ownership that offer advantages over making hotel reservations. Learn about alternatives including hotel-affiliated vacation clubs, in my article, which appeared in Vested (Summer 2015). Susan’s article, “The Art of Collection,” appeared in Vested (Winter 2015). It discusses how people can start collecting art, especially once retirement frees time for them to pursue their passions. Susan is quoted about writing tips for portfolio managers in a 929 Media article (subscription required) discussing a study called “Mutual Fund Shareholder Letter Tone — Do Investors Listen?” (Feb. 9, 2015). “Susan’s book, presentations and publications are worthy resources for those who prefer to write their own content (especially blog posts) but could use some practical bursts of inspiration to improve on the form and substance of their work,” says Wendy J. Cook in “Party On, Evidence-Based Advisors: 2015 Communication Resources: Part(y) One” on her blog (Feb. 8, 2015). Susan is interviewed about effective written communications, especially email, on the Women Rocking Wall Street podcast with Sheri Fitts. Susan is interviewed about her use of math in writing investment performance reports in this Q&A on the Math for Grownups blog (Jan. 12, 2015). Susan is quoted about networking in this article on The International Freelancer (Jan. 9, 2015). 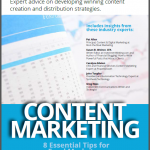 Win the investment marketing game with Content Marketing: 8 Essential Tips for Fund Marketers‘ tips from five contributors, including Susan (Dec. 2014). Susan’s gift recommendation for investment marketers appeared in “What To Give The Mutual Fund, ETF Marketer—9 Elf-perts Weigh In” on the Rock the Boat Marketing blog. You can also see a picture of Susan—and eight other experts—wearing elf caps (Dec. 4, 2014). Scottrade Advisor Services’ newsletter named Financial Blogging: How to Write Powerful Posts That Attract Clients as its November recommended reading (Oct. 31, 2014). “4 Tips for Turning Investment Commentary into Blog Posts” is my guest post on the Synthesis Technology blog (Oct. 23, 2014). I have four main tips for asset managers who want to get more mileage out of their investment commentary by sharing it on their blogs. “This book is enlightening, practical, thorough, clear and results-oriented,” says a recent review on Amazon.com (Oct. 22, 2014). Another reviewer says, “As a financial advisor I wanted to start blogging but I didn’t know how. I invested the money in Susan’s book. It’s helped me tremendously!” You can read more reviews on Amazon. If the thought of blogging makes you as nervous as an executive facing an IRS audit, stop worrying. You can overcome your challenges with these tips from my guest post on the AccountingWEB blog (Aug. 12, 2014). “Sharing content with clients and prospects on websites, social media and blogs is becoming an important component of the financial advisory business. Susan Weiner’s differentiator is that she helps financial professionals increase the effectiveness of their content,” says The New Age of Advice, a blog by Transamerica (July 21, 2014). “If you’re looking up terms when you get home from a visit with your advisor, that’s a bad sign,” as I say in this article on the USNews website (July 17, 2014). My use of Adobe Acrobat Pro is highlighted in an article about proofreading in The ASJA Monthly (July/August 2014). The article isn’t online, but you can read my proofreading tip on my blog. “Even if you’re not a financial advisor, I recommend following Susan on social media. She shares all sorts of great writing- and blogging-related tips and links that anyone can benefit from,” says Elizabeth Kricfalusi on the TechForLuddites blog (June 6, 2014). My post on “How to live-tweet a financial conference” was included in “Adam Sandler, Tortoise and the Hare, & Warren Buffett – #Blueleafing Roundup” of notable blog posts for financial advisors on the Blueleaf blog (June 6, 2014). “A news page featuring your firm’s mentions in the media can boost your credibility as long as you avoid one financial advisor’s mistake,” as I explain in this guest post on the Beck Law Firm blog (May 15, 2014). The New York Society of Security Analysts featured the CFA Institute review of Financial Blogging in The Finance Professional’s Post (May 12, 2014) and in its May 2014 member newsletter. “I sent a tweet asking for new clients. It worked almost like magic.” Learn my secrets by reading my guest post for John Refford’s socialmktgtech.com blog(April 26, 2014). “Your content is useless if people ignore it. You must engage them. Create content that focuses on your target audience’s needs. Make it easy to consume. Ask for feedback. The engagement that results will deepen your relationships with asset management clients and prospects,” as I say in the A-Z Guide of Asset Management Marketing, published by Kurtosys (registration required, April 2014). “Financial professionals have great information to share, but sometimes they get so excited about the technical details that their writing isn’t reader-friendly,” as I say in my Q&A on the Reputation.com blog (March 26, 2014). Learn about my “8 Top Tips for Creating Financial Blogs That Attract Clients” (for subscribers only) on Horsesmouth (March 19, 2014). Editor Sean Bailey’s interview with me is available to non-subscribers. Kristin Harad interviewed me about effective writing techniques (March 18, 2014) on this telesummit featuring 21 practice management experts. I’m number 40 on a list of 250 “Financial services influencers that you need to know online,” according to Jay Palter Advisory’s analysis using Little Bird (March 4, 2014). Abraham Okusanya of AdviserHangout shares his writing tips and interviews me about how advisors can improve their writing (March 4, 2014). “You don’t need to be a perfect writer to be a great blogger,” as I say in one of my many quotes in an RIACentral article (Feb. 10, 2014). “This book will improve your blogging. It will sharpen what you write about, the frequency at which you write, and how you write. This is a great book for financial bloggers,” says David Merkel on The Aleph Blog (Jan. 24, 2014). Susan’s article, “5 tips that make financial blogging easy,” appeared on LifeHealthPro (Jan. 24, 2014). “Susan Weiner, famous among CFA societies for her effective-writing workshops, has produced a powerful reference guide that should become the single best source for assisting independent and fee-only advisers in their blogging activities. The lessons contained in Financial Blogging: How to Write Powerful Posts That Attract Clients are highly accessible. Through exercises and outlines, reinforced with a workbook-style appendix, the reader quickly learns what it takes to accomplish excellent short-form communication,” says reviewer Janet Mangano in her review of Financial Blogging, which appeared on the CFA Institute’s Enterprising Investor blog (Jan. 16, 2014). Susan made the list of top 10 blogs for the RIA business. “Weiner is one of the best in this industry in part because of her consistent and passionate approach,” says the RIABiz article (Jan. 14, 2014). “Book on financial blogging offers a step-by-step guide, and practical solutions to common problems,” says ThinkAdvisor in its interview with Susan about blogging (Dec. 19, 2013). Susan’s tips for more effective emails are discussed in this Financial Advisor article by Mike Byrnes (Dec. 13, 2013). “It is a terrific guide for financial advisors who have not done a lot of writing. Though I got some ideas from it as well,” says Stephen Wershing in “You Should be Blogging—And Here is a Great New Guide to Help You Get Started” on The Client Driven Practice blog (Dec. 12, 2013). Susan shares her tips for powerful writing that attracts new clients and deepens your relationships with existing clients in a Q&A on DerivSource (Dec. 10, 2013). In “Nothing to share?” in the Marketing Minute newsletter, Marcia Yudkin recommends Susan’s Financial Blogging book as a resource for advisors who ask, “Why would anyone want to listen to me?” (Nov. 20, 2013). “For those FrazerRice.com readers slaving away in worlds of finance and law, this short piece by Susan B. Weiner at InvestmentWriting.com about what can sometimes feel like burdensome ‘Plain English’ compliance requirements, deserves a few moments of your time,” says Frazer Rice on his blog (Nov. 20, 2013). Susan shared her best tips for engaging clients and prospects with your market commentary, newsletters, and performance reports on the ByAllAccounts blog (Nov. 13, 2013). Susan’s tips on winning over your subject-matter experts appeared on the MarketingProfs blog (Oct. 18, 2013). “If you’re trying to cut through the noise with your own blog writing, Susan will help inspire you to greatness,” says Jay Palter in this post on the LifeHealthPRO blog (Oct. 18, 2013). “…advisers are posting their own tweets and blogs but learning the trade from subject matter experts, including Susan Weiner, author of ‘Financial Blogging: How to Write Powerful Posts That Attract Clients,’ ” says Bob Powell in his Retirement Portfolio column on MarketWatch.com (Sept. 14, 2013). Susan is quoted extensively on how to use informational interviews to develop corporate writing clients in the subscriber-only Freelance Success newsletter (Sept. 13, 2013). “What this book does is help you write good blog posts, after you’ve decided to be a blogger,” says Nancy McCarthy in her review of Susan’s book in The Value Examiner. (July/August 2013). 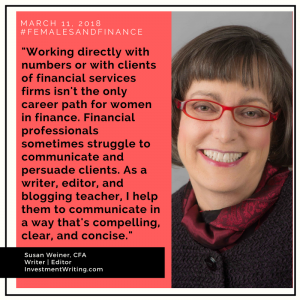 “Writer, editor and Chartered Financial Analyst Susan Weiner’s blog offers writing tips tailored to those in the financial industry. Her new book, Financial Blogging: How to Write Powerful Posts That Attract Clients, is also a must-read for financial advisors who blog (or who are thinking about doing so),” says Megan Elliot on the Wealth Management Marketing blog (September 4, 2013). How ETF issuers can use social media is the topic of this IndexUniverse article by Ann Logue, which quotes Susan extensively (August 26, 2013). Susan’s guest post about virtual assistants was picked up by the Financial Planning Association’s FPA SmartBrief (August 26, 2013). “If you’ve been thinking about launching a blog for your advisor website, or are looking for some tips and ideas of how to do it better, you may want to check out the list of Susan’s articles for some inspiration (and I recommend her book, too! ),” says Michael Kitces on Nerd’s Eye View (August 24, 2013). Financial Services Professionals: Do You Want to Blog But Don’t Know How? “In her new book, Financial Blogging: How to Write Powerful Posts That Attract Clients, Susan B. Weiner, CFA, teaches financial services professionals how to craft a blog that is effective and makes you shine,” says Kathleen Burns Kingsbury on the kbk wealth connection blog (August 13, 2013). Susan’s article, “Quantitative Easing for Regular Folks,” was reprinted by Advisor Perspectives (August 13, 2013). Financial Blogging: How to Write Powerful Posts That Attract Clients “will be one of the best investments you’ll make this year,” says Wendy Cook in her book review. “It walks you through clear, manageable steps for financial blogging” (August 6, 2013). The Investment Writing blog is the focus of this post on WordCount: Freelancing in the Digital Age blog (August 6, 2013). 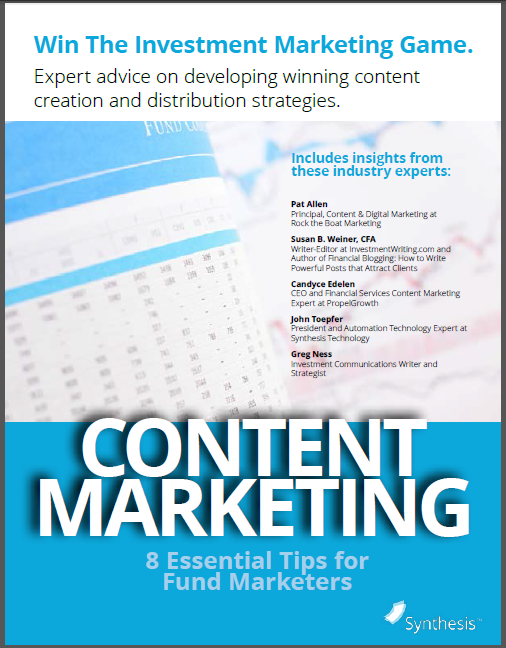 Susan’s “practical insights for advisors and financial marketers engaged in the content development process” landed her on Jay Palter Social Advisory’s list of thought leaders (August 1, 2013). One of Susan’s tweets was selected by ThinkAdvisor as a top tweet of July (August 1, 2013). “Financial services writing expert Susan Weiner provides a great piece full of practical tips and suggestions for anyone writing about complex topics to clients,” said Tony Vidler’s newsletter about Susan’s “Ideal quarterly investment letters: Meaningful, specific, and short” (July 14, 2013). “Susan Weiner offers valuable advice and tips on how to be a better writer and improve communications with clients,” according to this post on The Trust Advisor (June 24, 2013). 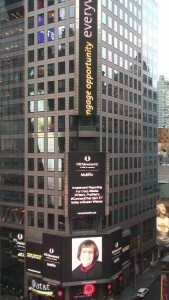 “Anyone in the financial services industry who aspires to write a successful blog should subscribe to Susan Weiner’s www.investmentwriting.com and consistently follow her advice,” said Philip N. Lawton in a footnote to his final post on The Middle Office before he takes his blog offline in July (June 16, 2013). News about Susan’s forthcoming book and her post, “Boost your blog with original photos: The SAGE Advisory example,” appeared on the Wendy J. Cook Communications blog (June 3, 2013). Financial Advisor IQ’s roundup included Susan (June 3, 2013). In its “Morning Call,” the blog linked to Susan’s post on “How to help your clients help their aging parents” (May 24, 2013). In this Content Marketing Institute piece, Susan is quoted on why you should avoid jargon (April 29, 2013). WealthChannelTV named the Investment Writing blog its “blog of the week” on April 25, 2013. Susan is quoted in Marcia Layton Turner’s April 23 article. The totalasset blog named Susan’s Twitter account (@susanweiner) one of the “Top 10 investment Twitter accounts to follow” on April 22, 2013. “Q&A format for articles: Good or bad?” was republished with permission on Ragan.com on April 12, 2013. Susan’s article originally appeared on the Investment Writing blog.